Circa 2200 BCE: Changes rocking the Continent reach Eire with the dawning Bronze Age. Well before any Celts, marauders invade the island seeking copper and gold. The young astronomer Boann and the enigmatic Cian need all their wits and courage to save their people and their great Boyne mounds, when long bronze knives challenge the peaceful native starwatchers. Banished to far coasts, Cian discovers how to outwit the invaders at their own game. 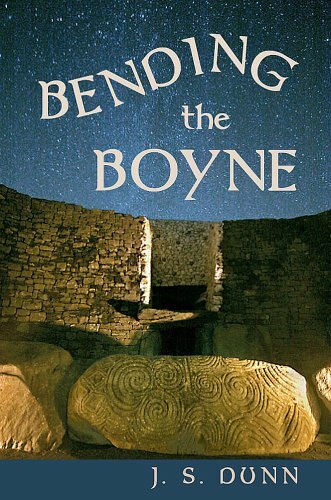 Tensions on Eire between new and old cultures and between Boann, Elcmar, and her son Aengus, ultimately explode. What emerges from the rubble of battle are the legends of Ireland’s beginnings in a totally new light. Larger than myth, this tale echoes with medieval texts, and cult heroes modern and ancient. By the final temporal twist, factual prehistory is bending into images of leprechauns who guard Eire’s gold for eternity. As ever, the victors will spin the myths. This story appeals to fans of solid historical fiction, myth and fantasy, archaeo-astronomy, and Bronze Age Europe. of an interesting archaeological story. William OBrien, PhD, University College Cork, Cork, Ireland. ...Bang-on with the latest archaeological debates. Awarded first place, Next Generation Indie Awards 2011 (USA). See main product page for trade reviews.